You are browsing the archives of The Master of happy Endings. 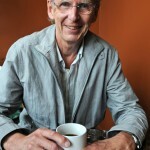 Here’s a few photographs I took of Jack Hodgins last week for an interview that ran in the Oak Bay News. I hadn’t seen Jack in a couple of years so it was great to have a few minutes to chat. His latest novel The Master Of Happy Endings is just out.